Background: A large number of people with severe mental illness receive no treatment. This treatment gap is largest in low and middle income countries (LMIC), with detrimental effects on individuals (social role, quality of life, stigma) and societies (equity, costs). Peer support is an established intervention involving a person in recovery from mental illness being employed to offer support to others with mental illness. Peers are an untapped resource in global mental health. Objective and methods: UPSIDES will scale-up peer support interventions for people with severe mental illness in high-, middle- and low-resource settings. 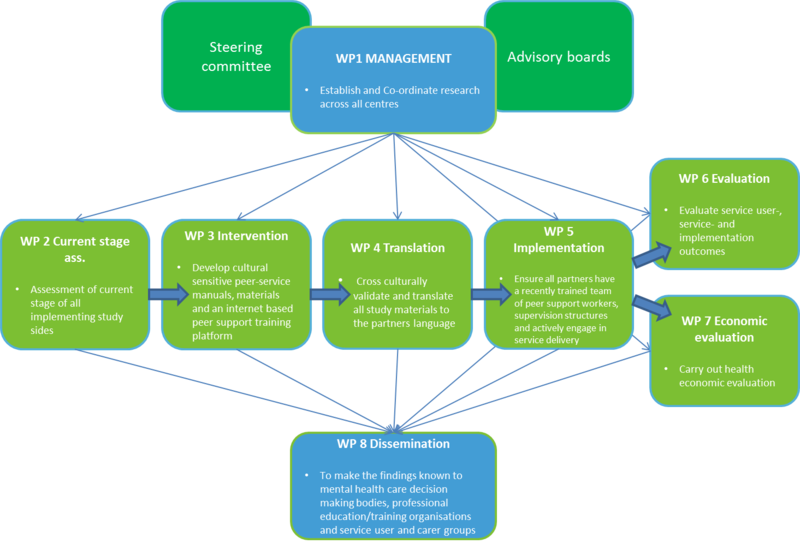 An international community of practice for peer support including peer support workers, mental health researchers, and other relevant stakeholders in Europe, Africa and Asia (eight study sites in six countries) will be established. Peer support will be adapted to be appropriate for local cultures. Using a mixed-methods approach, the impact of peer support will be rigorously evaluated at the levels of patients and peer support workers (psychosocial and clinical outcomes), services (cost-effectiveness, return on investment), and implementation (adoption, sustainability, organisational change). Evidence of best practice will be shared with local, national and international stakeholders ensuring that the peer support interventions reach new places and continue to be used successfully. Expected impact: UPSIDES will improve the lives of large numbers of citizens in Europe and LMIC by modifying mental health systems using the expertise of people with personal experience of mental illness. Involving peers will help to compensate for a lack of healthcare professionals in low-income settings. Performance of mental health services will be improved by actively involving and empowering service users, and moving towards patient-centeredness, recovery orientation, and community participation. UPSIDES will transform health systems towards realizing mental health as a human right. • A consortium of mental health researchers, providers and users will be established at eight study sites in six countries in Europe, Africa and Asia. • To understand the current stage of development of peer support and identify organisational and cultural considerations of the peer support worker role which may impact development. To scale up peer support models with a focus on vulnerable populations where pilot initiatives already exist. • By manualising existing interventions and building capacity in co-production and co-delivery of demonstrations. • By adapting existing tools, materials and strategies from demonstration centres to ensure cultural and situational appropriateness, or creating new ones, as needed. To rigorously evaluate inputs, processes and outcomes of implementation, including an assessment of process and contextual factors following a theory of change approach using mixed-methods. • To conduct a multi-site randomized trial augmented with qualitative methods, which will assess user-, service- and system-level outcomes. • To investigate active ingredients and key barriers and facilitators for research and practice. • By engaging diverse national and local advisory boards including service users, carers, senior clinical staff members, representatives of Health Ministries, hospital directors, community leaders, and and a Communications Taskforce.